Apart from these herbs, this patanjali activated carbon herbal facial foam also contains Activated Carbon, Honey, Vitamin A, Vitamin E, and Zinc Oxide. Patanjali Activated Carbon Facial Foam is used as a natural cleanser to remove dust, dirt, and bacteria trapped in the skin pores. It helps to eliminate the toxins accumulated in the skin and the ducts of the sebaceous glands. Activated carbon present in this patanjali herbal face wash cleanses the skin deeply while vitamin A and E make the skin smooth, and soft. The goodness of the other herbs, Aloe Vera, Lemon, and Neem, too offer unique skincare benefits, which help to improve the health of the skin and nourish it. Additionally, Activated Charcoal also produces an antibacterial effect and destroys the organisms trapped in the skin. This property of Activated Charcoal has been proved during research. Patanjali Activated Carbon Facial Foam also removes excess oils on the face and prevents greasy and sticky appearance. 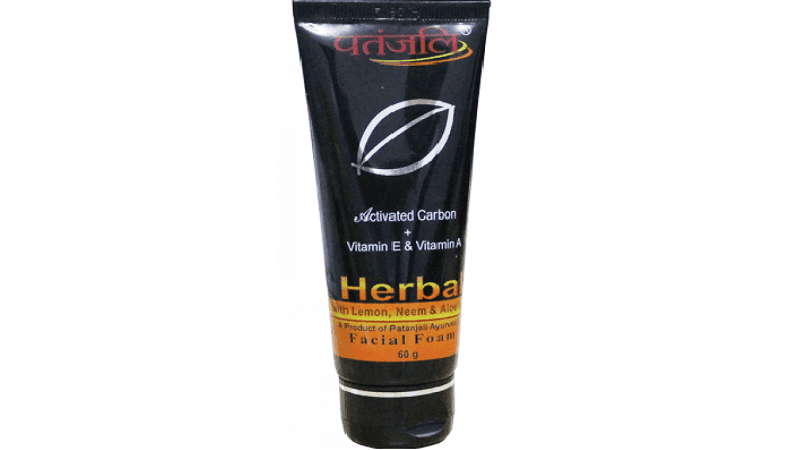 Patanjali Activated Carbon Facial Foam can help to reduce acne and acne scars. Activated charcoal present in patanjali activated carbon face wash helps to control infections in the skin and thus, reduce the risk of pustules. It also reduces whiteheads and blackheads by removing dirt and impurities in the layers of the skin. Aloe Vera and Neem present in patanjali herbal facial foam protect the skin against the damage caused due to free radicals and environmental toxins by producing an antibacterial effect. Additionally, Mint present in patanjali activated carbon face wash produces a cooling effect on the irritated skin and soothes it. This helps to enhance the tone of the skin and restores the natural glow. Patanjali Activated Carbon Facial Foam also contains Lemon Peel, which produces a bleaching effect and reduced acne scars. Apply a small quantity of Patanjali Activated Carbon Facial Foam on wet face, and massage gently for about one minute with water. Then, wash it off with plain water.